Bed and breakfasts, also called B&Bs, are one of the oldest types of accommodation that accept travellers. 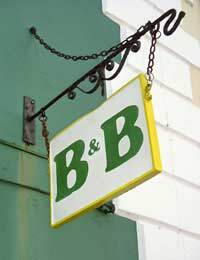 B&Bs are private homes that usually open several rooms to tourists interested in staying for a few nights. Typically these rooms are dedicated guest rooms, and most offer an en suite bathroom though in some B&Bs bath facilities are shared between guests. Breakfasts, generally hearty, cooked meals, are also included in the price of a room at a B&B. Though this set-up may sound typical of any other form of accommodation, B&Bs are run by private families and offer/require a level of interaction between guests that far exceeds a hotel or motel. For some travellers this greater intimacy is welcome, while others prefer the anonymity of a larger accommodation. In addition to the chance to interact with others, B&Bs often offer many other advantages for travellers. Typically the cost of a B&B is lower than that of a hotel, and cooked breakfasts are included in the quoted price. Many gap year travellers appreciate these lower prices as well as the homey, family atmosphere of a B&B. Bed and breakfasts also tend to be in more residential areas, which means that they may be closer to attractions that are off the beaten path, offer quieter environments (for work, study or sleeping) and allow travellers to get a feel for everyday life in new places. However, travellers should remember that B&Bs are private homes but not their homes. Cooking in the kitchen is usually off-limits, and use of the television, telephone or internet services is not necessarily available at all times. Staying at a B&B can be wonderful if it is a nice place but terrible if it is unclean, the hosts are not nice people, the other travellers aren’t interested in socialising, the food is bad or any number of other worst case scenarios. To avoid these situations, selecting the right B&B is important. For gap year travellers this means doing some research online to get a sense of which B&Bs are available in which areas, in order to see pictures of possible accommodations and so that they can read reviews written by those who have stayed in these places. Taking recommendations from other gap year travellers who have stayed in particular B&Bs is also a good idea. Most registered B&Bs are cleaned to a high standard and kept as safe as any other private home. There are some things that travellers can do to keep themselves clean and safe in any accommodation, however, including a B&B. Carrying a photo ID with you at all times, arriving in before any established “curfew” hour, keeping your passport and wallet/purse on you person at all times, locking away all small electronics and travel documents when you are outside of the B&B, getting to know the other guests, wearing flip-flops instead of going barefoot (even in the shower), keeping all personal care items in your room, and keeping your room neat and tidy will help to avoid any unwanted health or safety issues. If something does come up that makes you uncomfortable, discuss it with the B&B owners. Usually B&B owners are friendly, flexible people who want to keep their guests happy and coming back for more.